Dancing teaches me about myself in big, honest ways. Much like painting, but in a different way. I am generally in my own cozy home studio. That is partially why it is so mind-opening for me. and my practice is deepening. with that awkward feeling of beginning a practice. into the role of guiding, sharing and encouraging the practice of others (teaching). It is important to me to not forget the power of this vulnerability. At the start of 2012, I chose a word for the year. 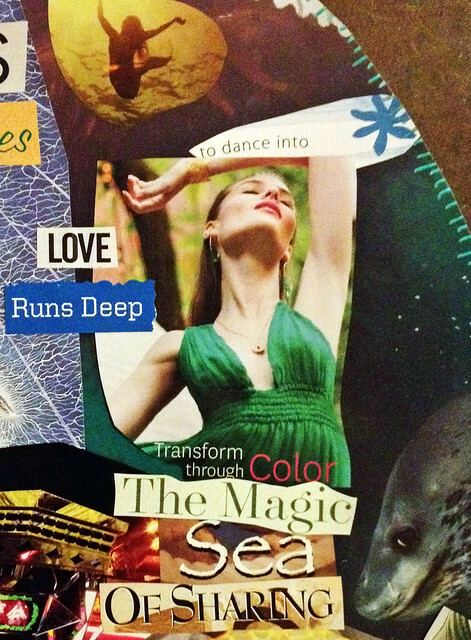 The word is SEA-Dance (SEA = Surrender, Enjoy, Activate). but became an actual vessel within which I would meet many parts of myself this year. when the music begins to move through you. as a gateway to the sacred spot in me. I believe I felt it, but left it unnameable. with our innate creative joy & response. It woke something up in me to pair dance with my painting practice. that I instantly became hooked. in honor of the cycle of learning and growing within myself and others. in the living presence of others. to transcend the details of those circumstances. I notice how I engage and express myself when in the presence of others. with being observed (or rather, judged), in my skin. It alters my movements and interactions in the group. and music has always been undeniable to my body. be used for the best expansion of all I influence and effect. even as I surrender to my connection with Source. It is part of the dance - moving in and out of this awareness. than I desire and intend to be. even when I'm deep in my own dance. and I am fearful of how I might interpret others seeing me. as if my presence has no place in their experience. passing through the powerful gateway of vulnerability into possibility. This is why I dance. even though it is uncomfortable, inside myself, at times. This is what I feel in the best moments of painting and moving my body. and I lifted my head to the light in the room. in a room of radiant souls just trying to do the same in their own beautiful dances. a big, intuitive, free painting in the air around me. Even in my dance, I was painting. I smiled, and held my head higher.